1st District Councilmember Ed Reyes presenting the Langer family with a to-go version of the new sign placed at 7th and Alvarado today. 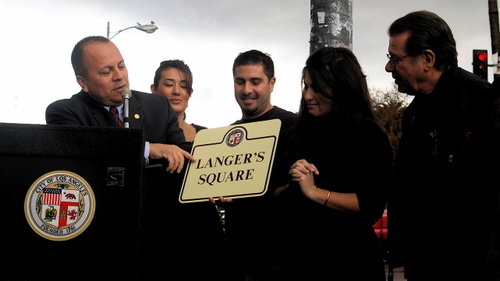 The dedication ceremony for Langer’s Square was in a proper place, next to the Langer’s Deli counter while a busy staff hurried out lunch orders. Orders like “Can I please have a quart of matzo ball soup?" 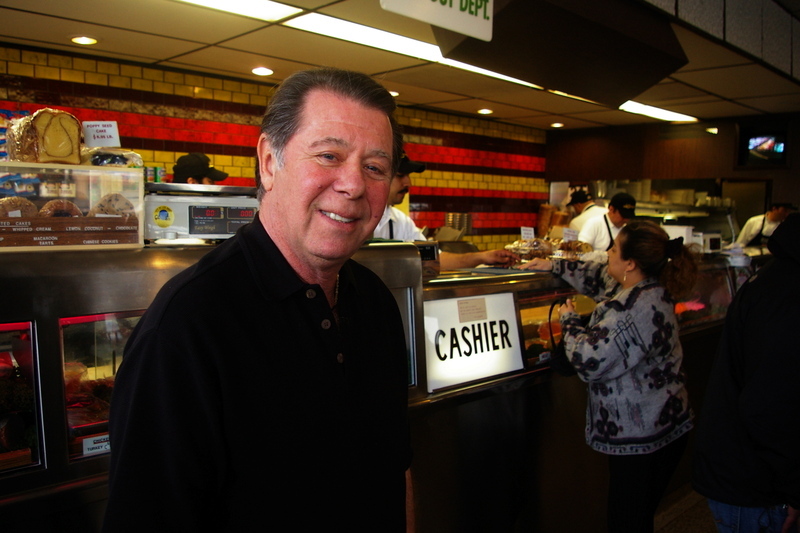 were shouted from the kitchen while Councilman Ed Reyes spoke about deli founder Al Langer, describing him as someone who “has been carrying the baton” for businesses around the MacArthur Park neighborhood. 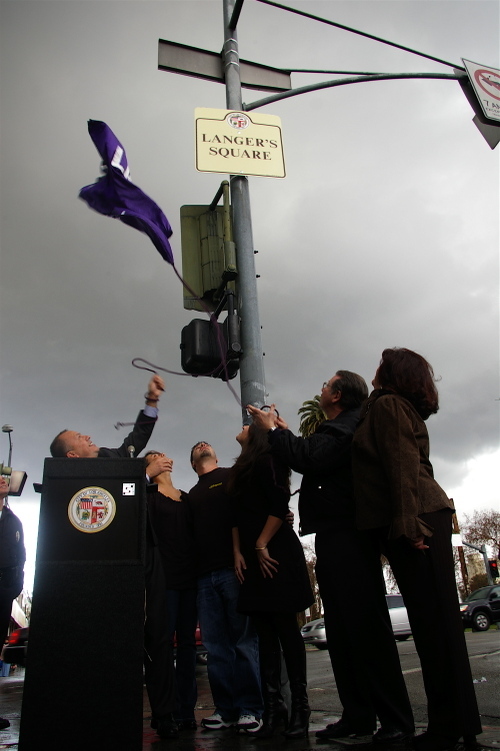 It was at a June 2007 ceremony honoring the deli’s 60th anniversary when Ed Reyes and Council President Eric Garcetti promised Al that the corner of 7th and Alvarado would be named after him. He passed away a few days later, but according to his son Norm Langer, he was happily aware of the honor. Al Langer would have celebrated his 95th birthday yesterday. Norm himself also spoke, welcoming the crowd and crediting public transportation for the survival of the family business; “We were blessed by the Red Line." Norm Langer of Langer's Deli. 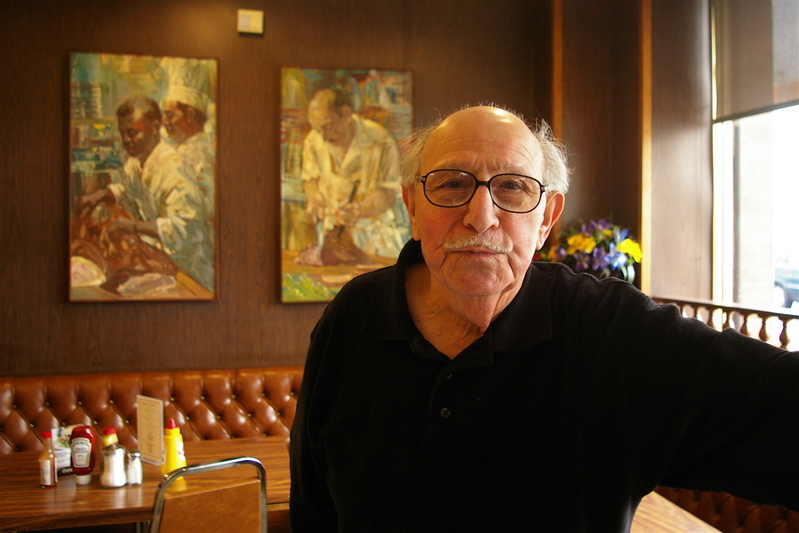 Art Lewcowicz retired as a sandwich counterman with 30 years under his belt. He's also in the painting behind him. 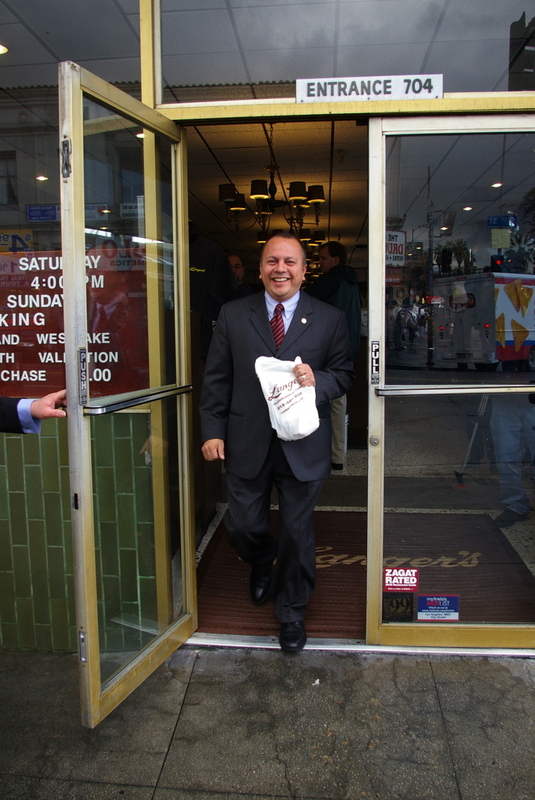 A closer look at some of the people inside Langer’s tells you the deli is a community within a community. Members of LAPD’s Rampart division were there with regulars like Mike Blanco from Highland Park who has been visiting Langer’s almost three times a week for lunch––since 1966. Waitresses and staff who have worked there for decades tried to be nonplussed about it all, but failed to hide smiles as the ceremonies went on. "Oh, it was so overdue," said one waitress as she balanced five plates through news crews standing in her way. 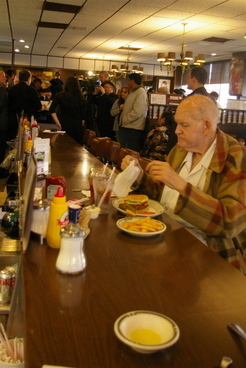 John Pennington dines while the speeches go on. He's seen it all, having been a regular since 1974. 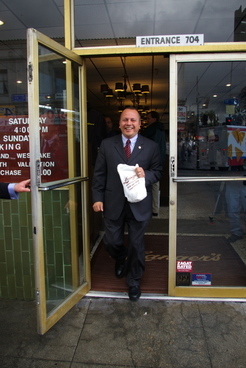 After the ceremony, Councilman Ed Reyes takes something back to Council Chambers. I just emailed you (at sbcglobal.net) and it bounced. How can I get a hold of you via email?